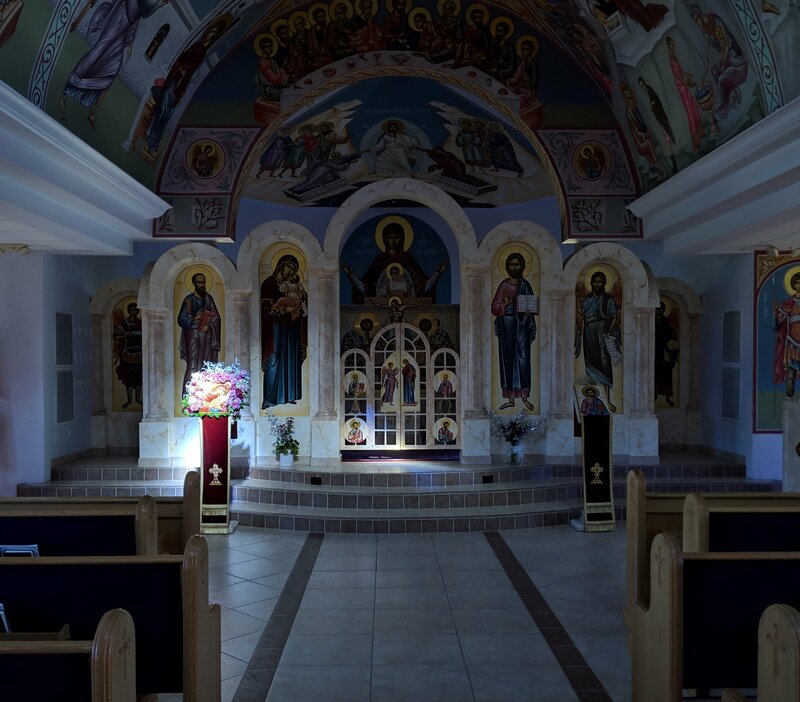 On April 14 in the Holy Orthodox Church, we commemorate the Apostles Aristarchos, Pudens and Trophymos of the Seventy; Martyr Thomais of Alexandria; and New-martyr Demetrios of the Peloponnesos. 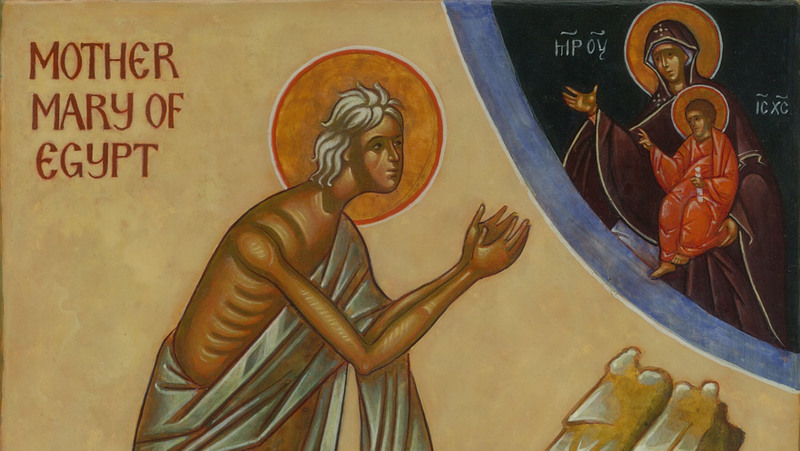 On this same day, the Fifth Sunday of Great Lent, it was ordained that we make remembrance of our Godly Mother Mary of Egypt. Spirit rose up, flesh melted away ere-while; hide, O earth, the worn bones of Mary’s body. 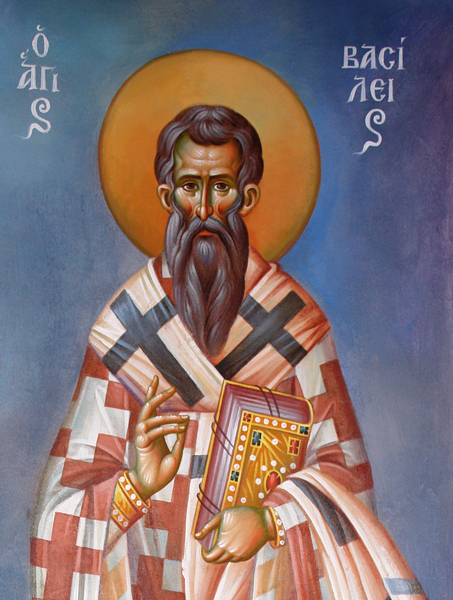 Once, during the Honorable Fast, the priest-monk Zosimus withdrew into the wilderness. He caught sight of a withered woman named Mary; her hair was white as snow. Mary then told Zosimus that she was born in Egypt and at the age of 12 began to live a life of debauchery in Alexandria for 17 years. One day, she went to Jerusalem to enter the church to venerate the Honorable Cross. However, some invisible force restrained her. 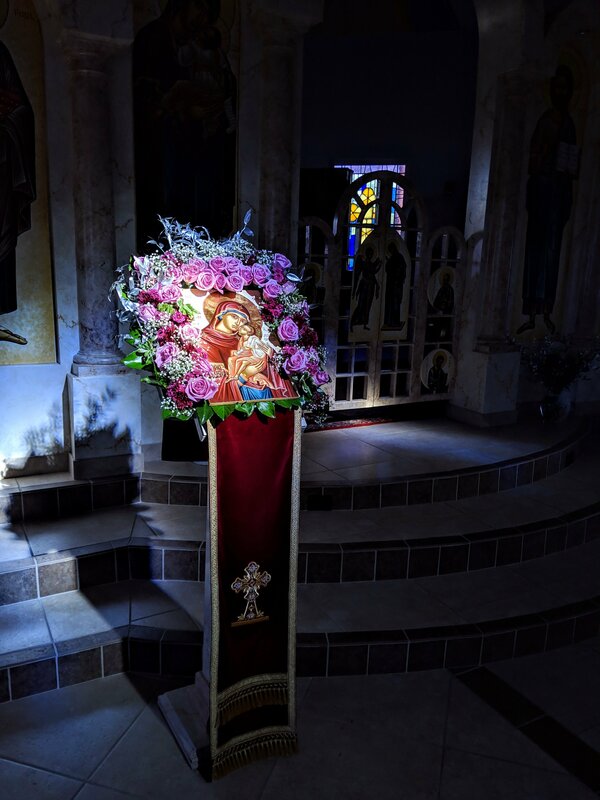 In great fear, she gazed upon the icon of the Theotokos in the vestibule and prayed that she be allowed to enter the church, all the while confessing her sinfulness. She was then permitted to enter the church. 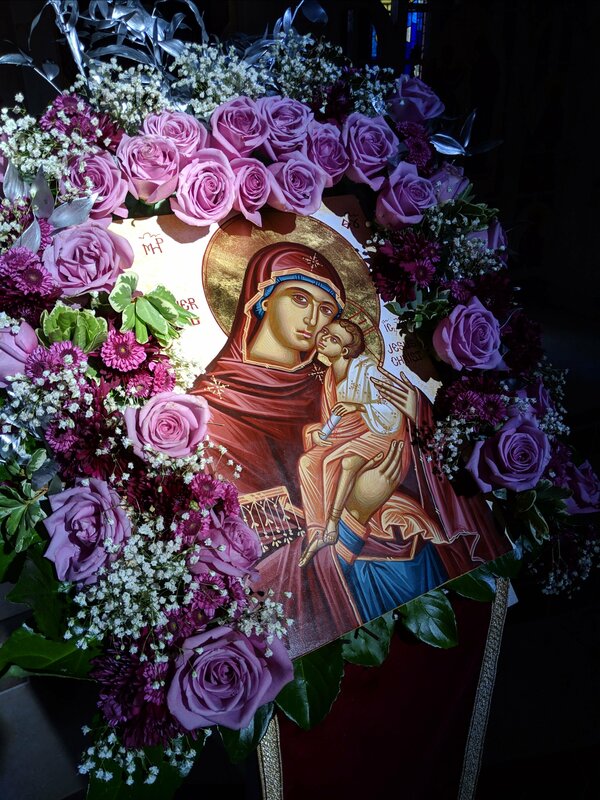 Having venerated the Cross she again entered the vestibule and, before the icon, gave thanks to the Mother of God. At that very moment she heard a voice saying: “If you cross the Jordan, you will find glorious rest!” Mary left for the wilderness and remained there for 47 years in repentance. She bade Zosimus to come back in one year with Holy Communion, which he did. 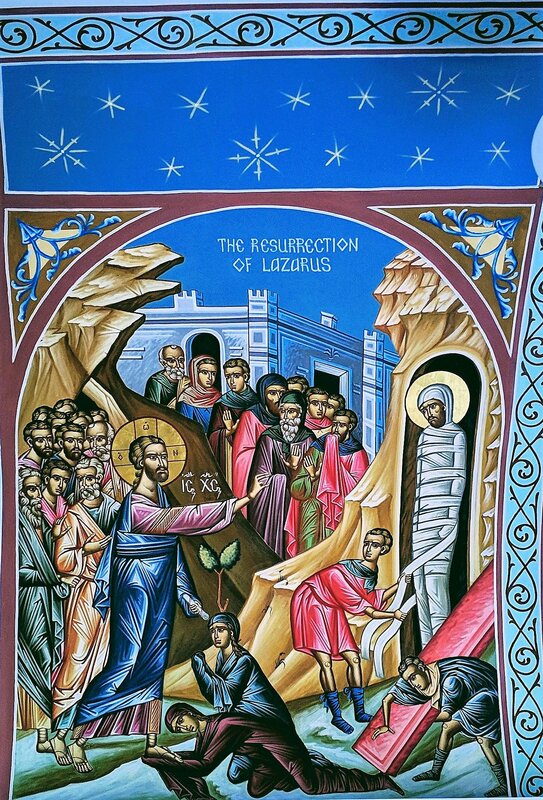 The following year, on Holy Thursday, April 1, 522, Zosimus discovered Mary’s lifeless body, and buried her. Thus, the Lord glorifies penitent sinners. The Church exalts and exemplifies Mary to the faithful in Great Lent as an incentive for repentance that brings entry into the Heavenly Kingdom. Through her intercessions, O Christ God, have mercy upon us. Amen. 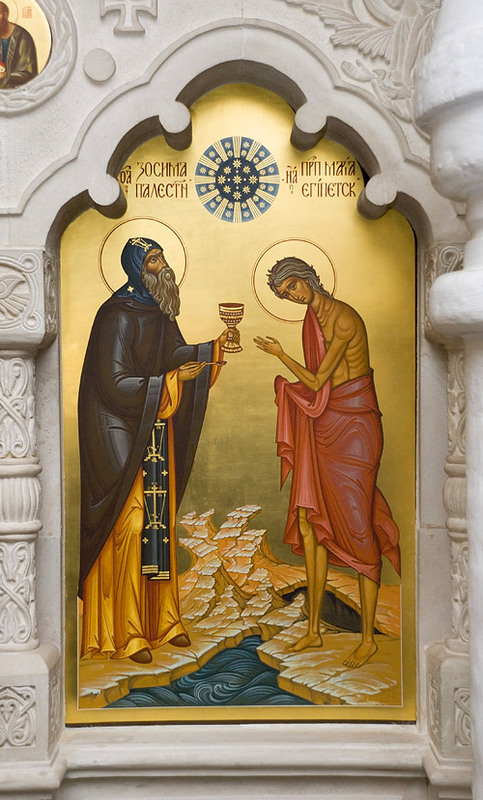 The Life of St. Mary of Egypt is also read to that end—to motivate us to be attentive and repent.canon contains every motivation toward fasting and repentance, and the Church repeats it in the fifth week in its entirety in order to inspire us with renewed strength to finish the course of the fast. 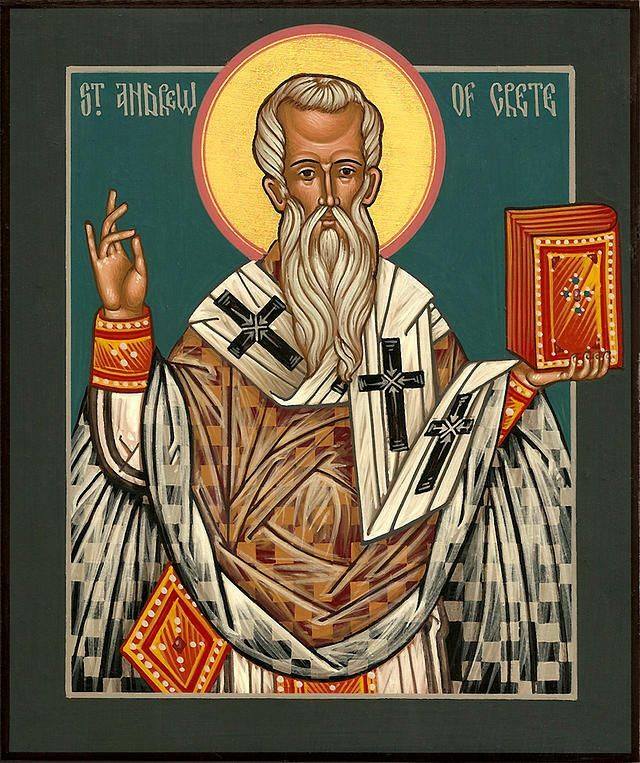 This This is the only time in the year when the Great Canon of St. Andrew of Crete, which was read in four parts during the first week of Great Lent, is read in its entirety, along with the canon to St. Mary of Egypt. Push yourselves, brothers and sisters! The time is now – not next year. 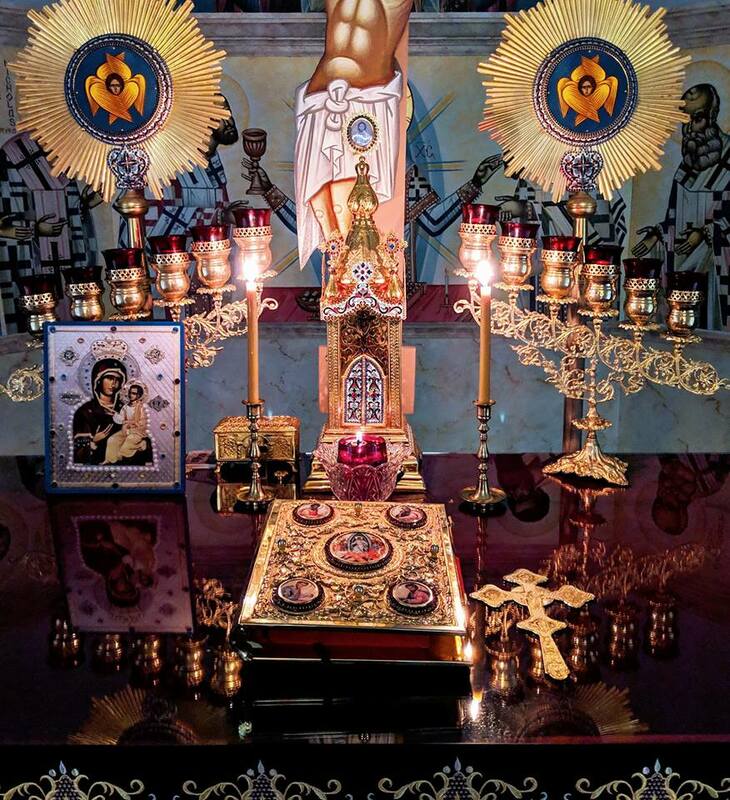 Tabernacle resting upon the Holy Altar at St. Paul Church in Naples, FL. Consider bringing something simple and Lenten to share at the Potluck immediately following service. 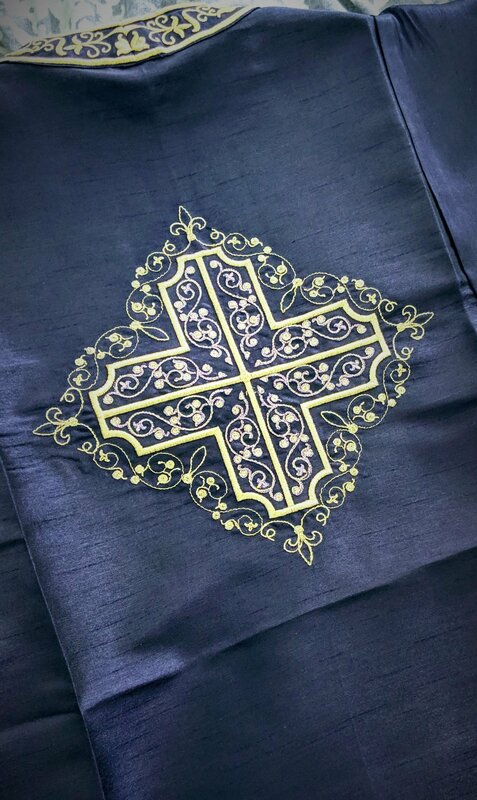 Don’t know how to make Palm Crosses? Don’t worry! We have great teachers – bring your scissors! Make sure to bring your children! 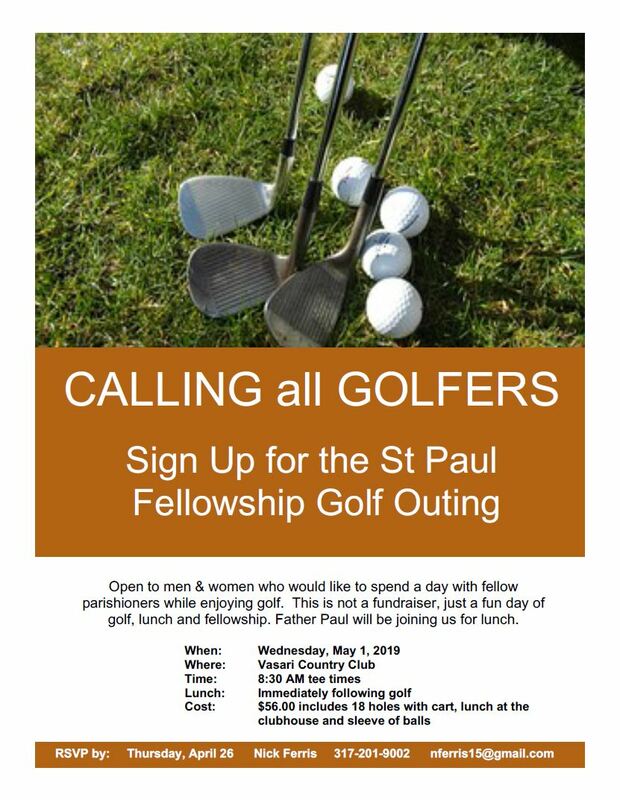 Select HERE for the full schedule or view the parish calendar. 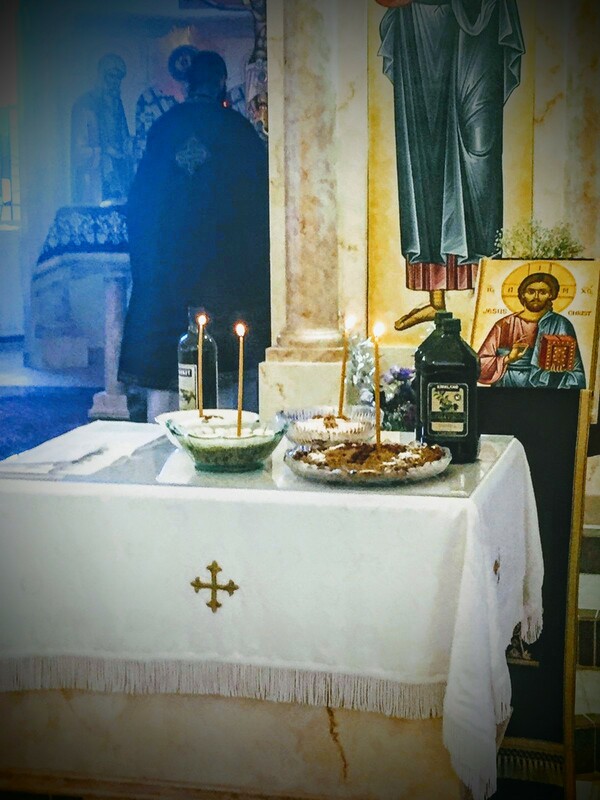 Offerings of boiled wheat (Kollyva), wine, and olive oil are blessed liturgically in connection with the Memorial Services in Church for the benefit of one’s departed, thereby making an offering unto God for the departed person, and in honor of the Sovereign Lord over life and death. The service leads to the meditation of God’s word and the glorification of his love for men. It instructs and allows us to praise God for the particular events or persons whose memory is celebrated and made present to us in the Church. It prepares us for the sleep of the night and the dawn of the new day to come. 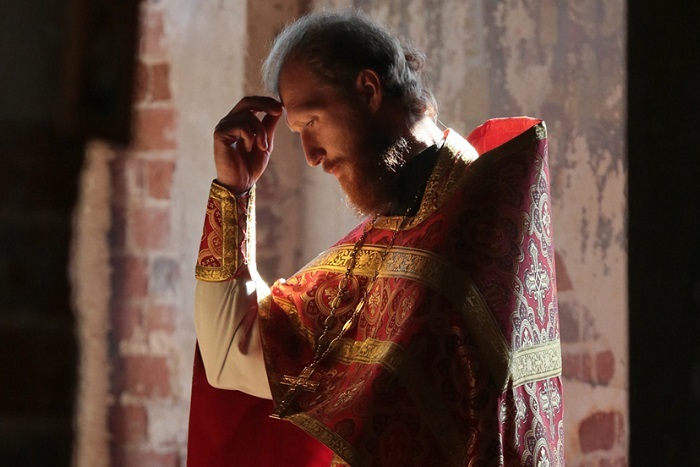 On the eves of the Divine Liturgy, it begins the movement into the most perfect communion with God in the sacramental mysteries. This concept is not new, but is found throughout the New Testament. Christ Himself, though firmly anchored in the Second Temple Judaism of His day and keeping the Jewish Law, pointed to something beyond it—the “new life” to which Fr. Alexander referred, a life given by the Spirit (John 3:5-8, 7:37-39). His followers would no longer need a temple with its priesthood and sacrifices to commune with God, whether that temple were on Gerizim or Jerusalem (John 4:21-23); His own flesh would be the new Temple (John 2:21). 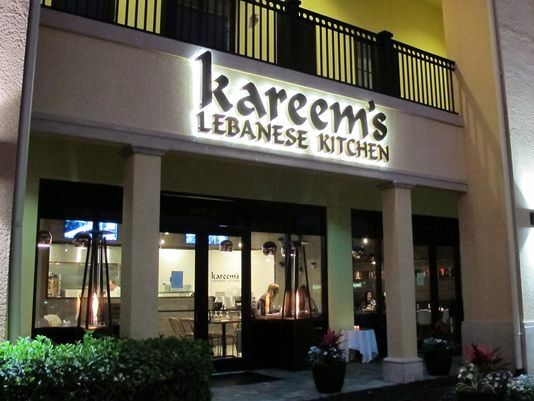 In that new life, Sabbath restrictions would no longer be ultimate (Matthew 12:16, John 5:8-11); nor would the food laws restricting certain foods (Mark 7:19). While living as a Jew faithful to the Old Covenant, Christ offered a new wine, a drink too potent to be contained within the old wineskins of that Covenant. The new wineskins of the Kingdom would be required (Mark 2:22). This fundamental insight is the source of St. Paul’s rejection of Judaism. Judaism, though divine in origin, was now no longer adequate because Judaism was a religion. Like all religions of the world, it was characterized by certain fundamental concepts and dichotomies. It had a priesthood which offered animal sacrifices—and the rule that priests alone could offer these cultic sacrifices. 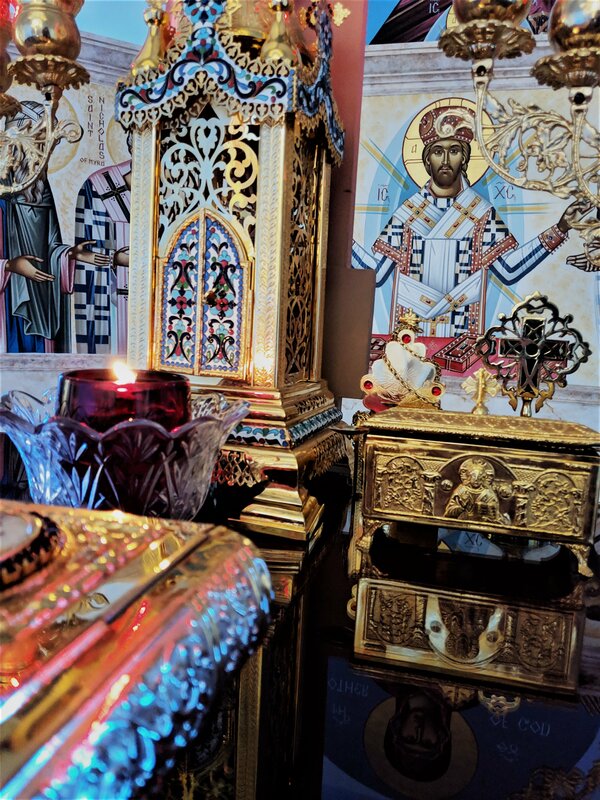 It knew of sacred space—the courts of the Mosaic shrine, and later of the Temple, and places to which only certain persons could go (such as the inner Holy of Holies). It had certain categories such as “holy-clean-unclean”, and said that the unclean could not offer holy sacrifices until they were cleansed. It also used the category of “clean-unclean” for certain foods, outlawing the consumption of certain animals. Using a lunar calendar, it declared certain days were holy—i.e. holy in themselves—days such as the Sabbath, the full moon, the Passover. These things were not unique to Judaism. All religions of the world used the same basic categories. They were not categories of Judaism, but of religion itself. 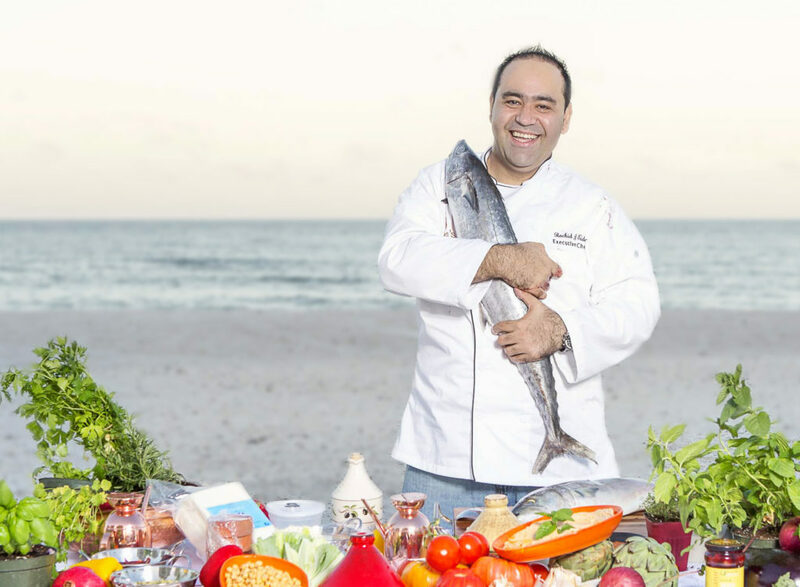 Religions might differ about which days were holy and which foods were allowed and who was allowed to function as a sacrificing priest, but they agreed that such categories were basic and constitutive. Such categories St. Paul termed stoicheia (Galatians 4:3, Colossians 2:8, 2:20). They were not wrong in themselves, but represented a retreat and renunciation from the new life given freely in Christ apart from them. Thus St. Paul taught that it did not matter whether or not one regarded a particular day as intrinsically holier than another (Romans 14:5), and that no food was unclean in itself (Romans 14:14, 1 Timothy 4:4-5). He regarded the Galatians’ adherence to the Jewish calendar as an alarming development (Galatians 4:10-11), and said that the Colossians’ submission to the decrees about unclean foods was unworthy of those who “had died with Christ to the stoicheia of the world” (Colossians 2:20-23). Religion was for the spiritually immature, for children, those who were no better than slaves (Galatians 4:1-3). But now that Christ had come to redeem us, we were such slaves no longer, no longer under any religion with its fundamental categories. In Christ mankind comes of age, and no longer needs religion. We can have the Holy Spirit instead, who is the pledge and participation in the powers of the age to come. It is easy to misinterpret Christianity as a religion like any other. For all major religions have books (the Torah, the Bible, the Quran, the Bhagavad Gita); they have officiating clergy (Rabbis, priests, imams), they have buildings in which to worship (synagogues, churches, mosques, temples). There is much commonality among their teachings—all say that kindness is preferable to cruelty, and that people should not murder each other or commit adultery. It is too easy therefore for those studying Comparative Religion to imagine that Christianity is comparable to the others. But, as we have seen, it is not so. The things which seem to be the same and comparable to things in other religions really are not. There is a superficial similarity, of course. But the inner and essential reality is different, just as there is a superficial similarity in the bodies of all men, and the real difference between them is found in their souls. One of the apparent similar things between Christianity and religion is in the fact that both Christianity and the religions have a class of people who officiate when everyone comes together, and who perform certain set liturgical rites. Often the term for them is “priests”. In Judaism and Greco-Roman paganism, their function was especially located in the offering of sacrifices. It is significant, therefore, that the term “priest” (Greek iereus; Hebrew cohen) is never applied to the Christian clergy. 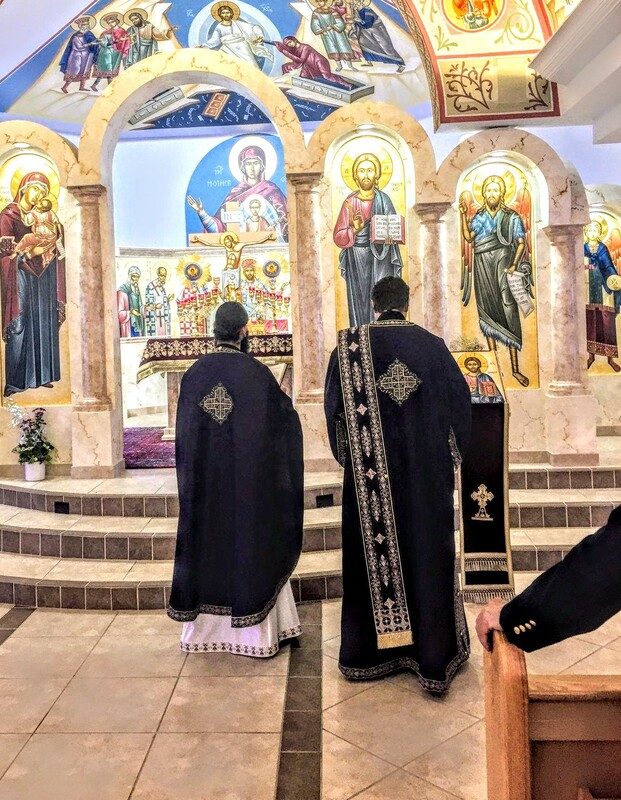 They are called “elders/ presbyters” (Greek presbyteros) or “overseers/ bishops” (Greek episkopos) or “shepherds” (Greek poimen)—but never priests. The Jewish priests are referred to by that term (Acts 6:7), but not the Christian clergy. In the Church that title is reserved for Jesus Christ alone—He alone is the first, true, and only priest in the Church. And one can see why—a priest is one who offers a sacrifice, and the only true sacrifice that avails to save and transform is the sacrifice of Christ’s body upon the Cross. All the other sacrifices of the Law were mere prophecies, pledges, prayers for a cleansing that would only come later. The Jewish priesthood—and, taking a wider more global view, all the pagan priesthoods of the world’s religions—found fulfillment in Him. He is the true priest, who offered Himself as the true sacrifice (Hebrews 8:1-5). Those who have liturgical or pastoral responsibility in His Church are not, properly and strictly speaking, priests. They do not offer a sacrifice like the other Jewish and pagan priests offer sacrifices, for the only sacrifice we need has already been offered. It is true, of course, that the term “priest” has been applied to the celebrants of the Eucharist—first to the bishop (when he was the main celebrant) and then to the presbyters (when they later took over this function). That poetic attribution of title was not incorrect, for it was based upon the insight that the celebrant offers by anamnesis or commemoration the one true sacrifice of Christ. The celebrants were thus priests not in their own right, but by virtue of their role as liturgical heads of the royal priesthood, the Body of Christ our high priest. Referring to them as “priests” meant only that they presided over the Church’s sacrificial anamnesis, not that they slaughtered animals and offered them up with their blood in sacrifice upon stone altars. (That was the point of calling the Eucharist “a bloodless sacrifice”.) Christianity is not a religion, and its officiating clergy are not strictly speaking, priests. 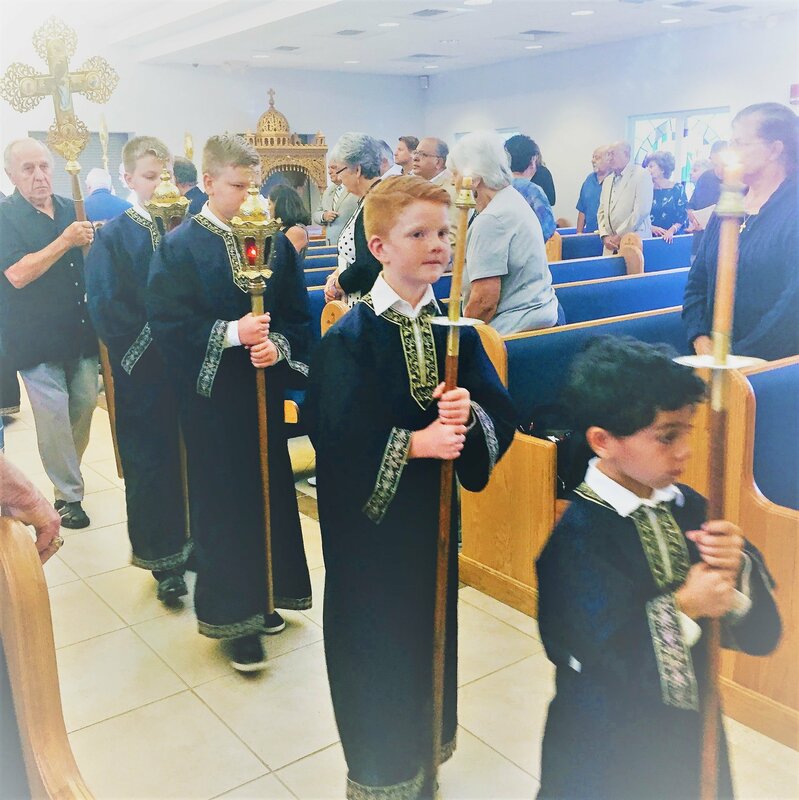 Their priesthood consists of their calling to manifest through the Church’s corporate liturgical worship, the true and saving sacrifice of Jesus Christ. They are priests, not in their own right, but through their ordained participation in the heavenly priesthood of their Master. The coincidence of title between the Christian priests and the priests of the Jewish religion should not mislead us into thinking that Christianity is just another religion. Christianity is not a religion, but the sacramental presence of the incarnate God on the earth.